KIEV, Ukraine -- As world powers focus on freezing the conflict in Syria, the war in Ukraine continues unabated. A pro-Russian separatist soldier runs at the Donetsk’s Sergey Prokofiev international airport during shelling between Ukrainian army forces and pro-Russian separatists. According to international monitoring organizations and soldiers on the front, the fighting has reached levels not seen in months. On Monday, three Ukrainian soldiers were killed and six were wounded, according to a tweet from Col. Oleksander Motuzyank, a military spokesman for the Ukrainian government. The deaths follow a sharp-uptick in violence between government troops and Russian-backed separatists. 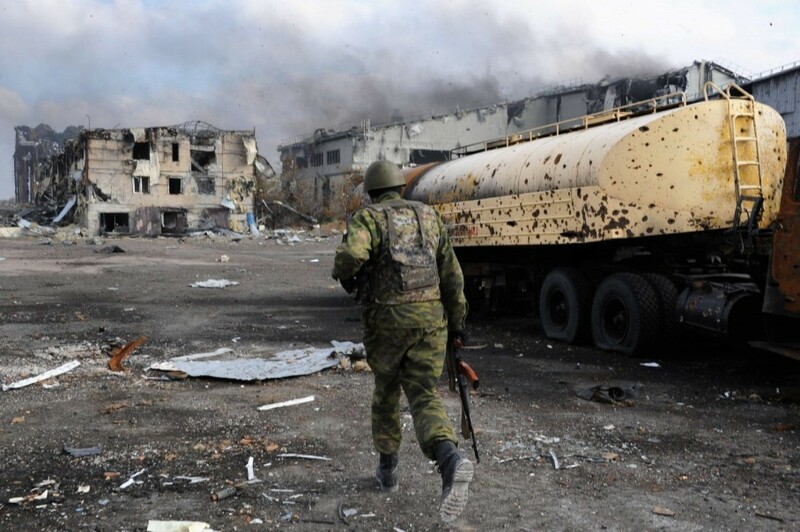 The Organization for Security and Cooperation in Europe, or OSCE, has recorded numerous cease-fire violations in recent weeks, including the use of heavy weapons, such as 120mm mortars and BM-21 multiple rocket launch systems. 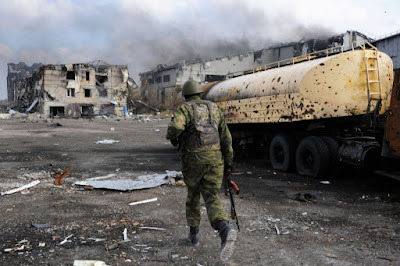 Heavy weapons above 82mm were banned in previous cease-fire agreements known as Minsk I and Minsk II and are supposed to have been moved back from the front lines. In addition to the fighting, there has been “circumstantial evidence” that Russia is rearming the separatists, according to Lamberto Zannier, the secretary general of the OSCE. Zannier, speaking to the Wall Street Journal in a recent interview in Munich, added that situation in east Ukraine is at a new low point since just before a pause in fighting in September. The Minsk cease-fires were supposed to be implemented by the end of 2015, but have been extended into 2016. Both the Ukrainian and Russian government accuse the other of failing to satisfy its portions of the agreement. Russia has yet to cede border control in east Ukraine back to the Kiev-based government, while Ukraine’s promise of local elections in the occupied areas remains unfulfilled. In Pisky, a small town outside of the strategically important Donetsk airport in eastern Ukraine, soldiers there are constantly fighting from their now-frozen trenches. According to Maj. Konstantin Bernatovich, a press officer with the unit fighting in Pisky, their positions are hit with heavy mortars and tanks regularly. While both sides remain firmly entrenched and fighting is relegated to static battles of machine guns and artillery, the towns caught in the midst of this eerily ancient trench warfare have become demilitarized zones littered with wreckage and unexploded ordnance. If civilians remain, many live underground and without electricity. From March 2014 to March 2015, 109 children were maimed because of landmines and unexploded bombs in Donetsk and Luhansk, according to UNICEF’s most recent report on the issue. According to the International Displacement Monitoring Center, there are 1.4 million internally displaced people within Ukraine as of August 2015. More than 9,200 people have been killed in the conflict. As the war nears its two year anniversary, the Kiev-based government continues to face issues with systemic corruption. On Tuesday, President Petro Poroshenko asked Prime Minister Arseniy Yatsenyuk to step down as the embattled minister faces a vote of no-confidence from his parliament.